Samsung Galaxy S4 vs. LG Optimus G Pro — which smartphone will win your loyalty? Editor’s Note: Please check out our recent series comparing the Samsung Galaxy S4 and the HTC One: Part 1 and Part 2. Also see our recent series comparing the Samsung Galaxy S4 and the iPhone 5: Part 1 and Part 2. During the first quarter of this year, several smartphone manufacturers have showcased their latest creations; the smartphones that will be characterized as “top of the line” for the next several months. HTC has the One, Sony revealed its waterproof Xperia Z, LG introduced the oversized Optimus G Pro, and of course, Samsung’s Galaxy S4. The latter is without a doubt one of the most impressive smartphones ever created, but it has a pretty difficult road ahead. The Galaxy S series has been a tremendous success, and evidently, the Korean manufacturer wishes to keep the trend going. Let’s begin comparing these two titans by having a closer look at their hardware specs. The Galaxy S4 sports a 5 inch Super AMOLED display featuring a full HD resolution of 1080 x 1920 and a pixel density of 441 pixels per inch, a Snapdragon 600 quad-core CPU clocked at 1.9 GHz or an Exynos 5 Octa processor consisting in two quad-core CPU pairs (Cortex-A15 @1.6 GHz + Cortex-A7 @1.2 GHz), 2 GB of RAM, 16 / 32 / 64 GB of internal storage (expandable by up to 64 GB with the help of a microSD card), a 13 MP rear-facing camera featuring HDR and optical image stabilization, a 2 MP front-facing camera, a 2,600 mAh battery and Android 4.2.2 Jelly Bean (with the new TouchWiz Nature user interface on top). On the other side of the fence, the LG Optimus G Pro packs a larger 5.5 inch Full HD IPS Plus LCD display boasting a resolution of 1080 x 1920 and a pixel density of 401 pixels per inch, a quad-core Snapdragon 600 CPU running at 1.7 GHz, 2 GB of RAM, 32 GB of internal storage (expandable via microSD by up to 64 GB), a 13 MP rear camera with HDR and image stabilization, a 2.1 MP front-facing sensor, Android 4.1.2 Jelly Bean and a 3,140 mAh battery to keep everything up and running. Hardware-wise both of these smartphones are quite similar. The Optimus G Pro stands out thanks to its larger display –which pretty much makes it a so called “phablet.” The Galaxy S4, on the other hand, offers a more powerful processor than the Optimus G Pro. Whether it’s the Snapdragon 600 CPU (with a frequency of 1.9 instead of 1.7 GHz), or the Exynos 5 Octa which delivers mind blowing benchmark scores, the Samsung phone takes the cake in terms of on-paper performance. Nevertheless, the difference might not be as great in real-use case scenarios in order to make it count. In reality, users couldn’t go wrong with either one of these two smartphones, at least not when it comes to internal specs. Hardware-specs aside, both the Samsung Galaxy S4 and the LG Optimus G offer a pretty wide range of custom software features, aside from what vanilla Jelly Bean has to offer. In terms of operating system, the Galaxy S4 is the winner here, simply because it delivers Android 4.2.2 which is the latest version, whereas the Optimus G Pro is a few steps behind (Android 4.1.2). Nevertheless, in terms of custom features, it’s quite difficult to pick a winner, as both devices offer a bevy of unique applications. The Diplomat has previously discussed, in greater detail, Galaxy S4’s range of apps – from Dual Shot, Picture & Sound, Smart Scroll and Smart Stay, all the way to S Translate. In contrast, the LG Optimus G Pro delivers its fair share of compelling apps such as QSlide (which is a multitasking tool similar to Samsung Galaxy Note 2’s Multi Window app), QMemo – a virtual notebook, QTranslate which enables the user to translate text after capturing it with the handset’s camera, as well as QRemote and a very rich notification drawer. In the end, both smartphones are very appealing,similar yet unique in their own ways. As long as potential buyers get the one that best caters to their needs, it’s hard to go wrong with either device. Don’t hesitate to share your opinions in the comments section below! Tech lovers across the globe await the Samsung Galaxy S4. Will it match all the hype? We will know soon enough. 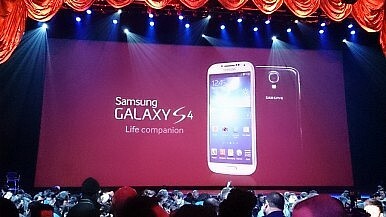 No Longer a Rumor: Samsung Galaxy S4 Set For March 14th ReleaseSamsung Galaxy S4: Release Date Pushed Back? Samsung Galaxy S4 Rumor: New Feature Looming?Samsung Galaxy S4 Rumor: Verizon Bound? Samsung Galaxy S4 Rumor: Gesture-Based Technology Included?